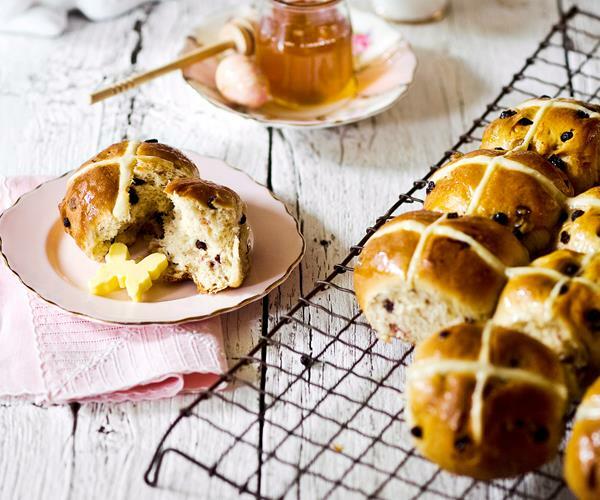 Who doesn’t love warm, buttery hot cross buns? Biting into a toasted, spiced bun packed with fruit or if you’re lucky, chocolate. It’s the thing dreams are made of. We think you should have a go at making these delicious buns of goodness yourself, so we’ve hunted down our favourite recipes for you to try. You can’t go wrong. Well, maybe you can. Give it a go anyway. Easter is already the perfect holiday for the sweet tooths among us (me) so why not indulge yourself a little bit more with chocolate and caramel hot cross buns. Traditionalists, steer clear. There’s no fructose in these hot cross buns, which if you’re not familiar, is the most problematic type of sugar. They’re sweetened with rice malt syrup and stevia! Not a sweet tooth? Well, Easter probably isn’t your favourite time of year. Luckily we’ve found a savoury twist on classic hot cross buns. You’re welcome. A fruit and nutty twist on the classic. You’d be nuts not to try it. There you have it, our favourite hot cross buns for you to cook and impress your friends and family with. They’ll be very grateful. And impressed, did we mention impressed? Impress them even more by using Playt to shop recipes and have ingredients delivered to your humble abode. Magic. Easter magic.